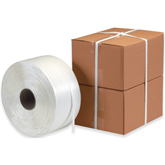 1/2" x 9,900' 9x8 Poly Strapping can perform tasks such as box closure, bundling, and palletizing. Machine Grade Poly Strapping is half the weight of steel strapping, and it does not have sharp edges making it much safer to use. Polypropylene Strapping has been designed to handle the break strength of 350 lbs Nominal Break Strength.